There were still a few nasty bugs that were found in 4.0.8, so here’s an update that squashes them. The selection and Line/Curve tools should now be trouble-free for everyone! Reported the selection tool crash bug this morning and get a return email less than 8 hours later saying the bug is fixed – fantastic service! I just wish the big organizations had the same level of customer support and service Rick provides. 10/10! However, that doesn’t prevent me from taking advantage of touch as an input source, or optimizing the UI to be much more touch friendly. Win10’s “tablet mode” makes that much more feasible. I don’t see Paint.NET moving to phone. That doesn’t even fit most usage scenarios for the app. Plus, nobody has a Windows Phone. My dad does. At least it isn’t an iPhone, though. My name is “nobody” and, “plus”, I do have two of those either. I don’t like insecure platforms like Android or iOS (BTW OSX and iOS were the most insecure platforms according to this: http://www.lifehacker.com.au/2016/01/what-was-the-software-with-the-most-vulnerabilities-in-2015-hint-its-not-windows/ and this: http://www.cvedetails.com/top-50-products.php?year=2015 ). Your security concerns regarding the other platforms are completely valid. I trust Microsoft with respect to security MUCH more than Google or Apple, even before those articles were published. I’m particularly amazed that Android hasn’t yet had multiple Blaster events. Pressure sensitivity doesn’t require UWP, thankfully. It just requires wrapping your brain around the Win32 Pointer API … and, to be fair, it’s mostly just cumbersome and has poor documentation. It is, however, a bit onerous to implement in an application that’s already doing 100% of its processing via the mouse/keyboard paradigm, and which must also run down-level (Win7). I would love to see Windows Phone enjoying more popularity. Despite Microsoft’s best efforts it just hasn’t happened and I don’t see it ever happening unfortunately. Right now, the Windows 10 phones are the kickers, as they are technically top. And with the dicks You will be having all(!) usage-szenarios of lap/desktops, so there is need for paint.net on windows-phone-10/arm. I don’t work at Microsoft these days. great,thanks. add the stretch tool, select an area inside picture and only increase its size or stretch that bit while rest of picture follows perfectly. You mean the Move Selected Pixels tool, which already exists … ? I asked this in the last update, but never really got a response. It there a chance that we could see xBRZ and/or RotSprite support, to make resized and rotated images look better? For Image->Resize, a plugin system could be pretty straightforward. For adding sampling modes to the Move Selected Pixels tool, things get much more complicated. Do you know whether RotSprite can be implemented at 30fps for large images? 🙂 The code for bilinear sampling there in Paint.NET is pretty ridiculously complicated. Any idea why the recent update takes forever to install? Specifically, the .NET framework? It seems like it isn’t even moving and I’m not going to install it if its gonna take hours to finish. I am still hoping for a “save all” function. Is that still going to happen? By save all function I mean saving all open projects without having to type a name for each one by one. If I have 10 projects open and want to quickly exit paint.net I have to save them one by one. Thanks for the great work as ever Rick! Argh! It doesn’t work that way on any system I tested on. I did get a report of this on a Windows Insider “Redstone” build, but haven’t seen it myself on RTM or TH2 (which is what you have — build 10.0.10586). Having the OS version # in this screenshot helps, btw. I was wondering if the size of the pointer / crosshair was within your control or if this is governed by Windows? I recently bought an MS Surface Book and because of the very high screen resolution the crosshair has become incredibly small. It’s not too much of a problem when it’s over the canvas but is very easy to lose when anywhere in the gray region surrounding the canvas. If the size can’t be adjusted then could it be made a bright color when over the gray region? I don’t know if somebody has reported my problem before. When I open JPEG files with lot of exif included and I save the file, I miss the entry for lens type. I use an Olympus OM-D E-M1 with two different Olympus lenses (12-40mm f2.0 & 75-300mm f4.8-6.7II). I don’t know if other tags are missing. But that tag is what I found and miss. Heh, thanks for fixing line bug. I’ve met it just a day ago. Developing a videogame wants nice working software, and PDN is still one of the best. Suggestion for a later update; could you add a “shape top left” indicator at the bottom like how rectangle select has? It’d really help with making things perfectly centered and such. If I upgrade will I lose my plug ins? Hello everybody. 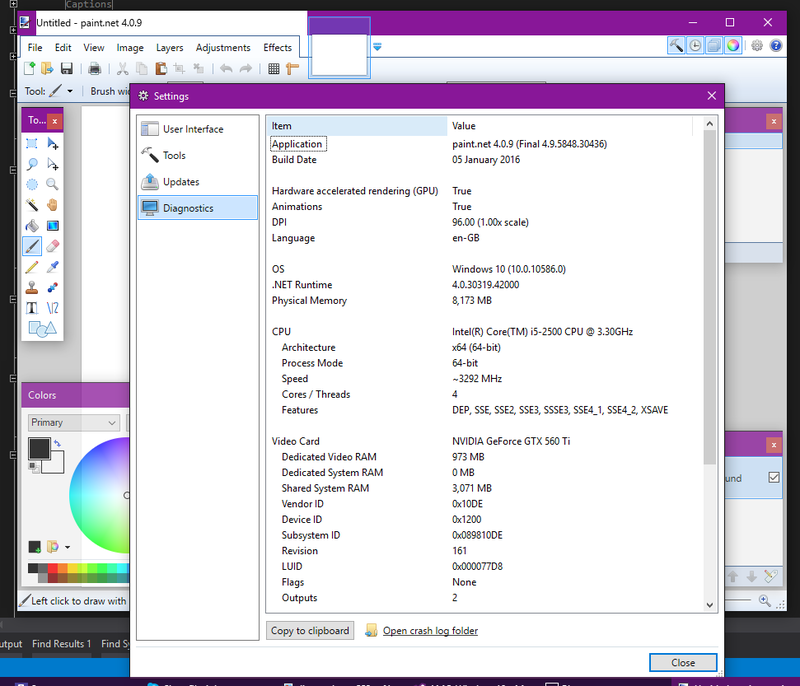 I am not a great expert so excuse me please for my following question : Paint.Net 4.0.9 works under Windows 10 ? I have 3.5.10 version workingh with Windows 7 64 bit and I want to upgrade my system to Windows 10. Thank you very much for your kindness. Will you finally fix the line/curve drawing bug? I did fix some important Line/Curve bugs in 4.0.8 and 4.0.9. What bug might you be referring to? Just wanted to say thank you! Paint.net has been a lifesaver for me & my businesses. Hello! This editor helped me to create a new textbook on surgery. Thank you! Also, the ability to natively import/export 32-bit BMP images, or to embed a transparency threshold on 24-bit PNG/BMP images (with Alpha Dithering) would be really handy. I have, derp. I forgot that I already saw/commented on this post. 4.09 wont run on my Win 8.1 – apparently I think its because the .net component isn’t stand alone any longer ans so MS prevents it from running. I cant go backwards either…this is so frustrating! Try going to the Micro$oft website and downloading the various .NET installers (Framework and Core, both), Visual C++ Redistributables (both x86 and x64), and so on, and install them all. You can also try running the latest .NET installer and repairing your existing installation. The reason you should install all of the .NET versions, including older ones, and the reason you should install both the x86 and x64 Visual C’s is because different programs will not run unless you also have the older versions, and some 32-bit programs won’t run properly on 64-bit Windows without the 32-bit runtimes installed alongside the 64-bit ones. Now if your version of Windows is 32-bit, and not 64-bit, you don’t need the 64-bit runtimes. I’d still get them though and put them on a flash drive (or burn them to a CD), because Microsoft might eventually remove them from their website. I desperately need the drop shadow function, just like the one in photoshop or gimpshop. Is there a plugin or something that really works? That’s actually coming in the next update. Using “edit” button in explorer opens paint instead of paint.net. Problem occured after one of the recent updates. Reinstalling paint.net didn’t help. Windows 10 Pro x64. Any chance pressure sensitivity for use with drawing/ graphic tablets will come to Paint.net, in the future?